A well-guarded military base can imply that such areas—including the nearby military towns—are safe and secure. According to the Military Family Advisory Network, 78% of surveyed military personnel still live off base and in the surrounding cities. 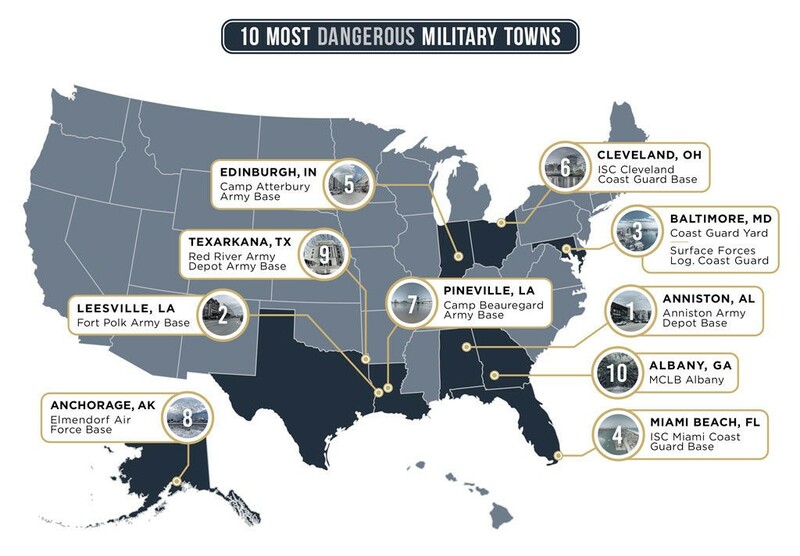 This made us wonder which military towns in the US are the safest and which aren’t as secure for military personnel and civilians. 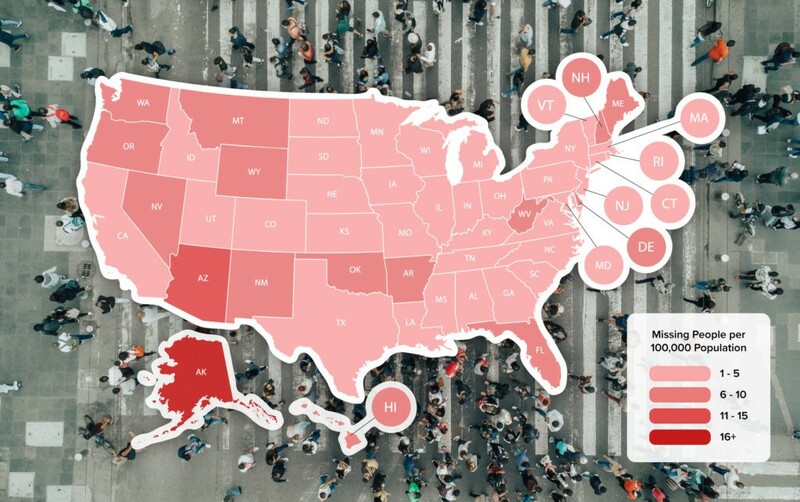 The team at Vivintsource.com looked at Navy, Army, Air Force, Marine Corps, and Coast Guard installations to identify the ten safest and least safe military towns in the nation. 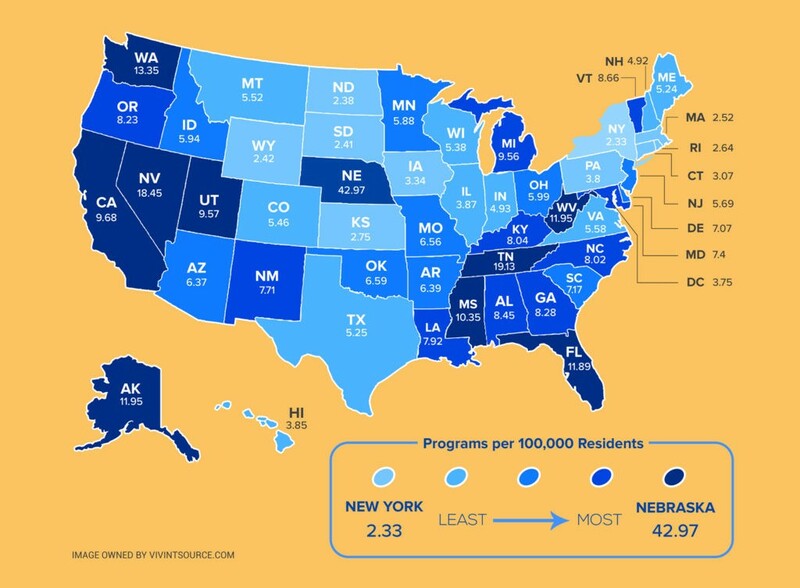 Check out the details below to see where your military town ranks. 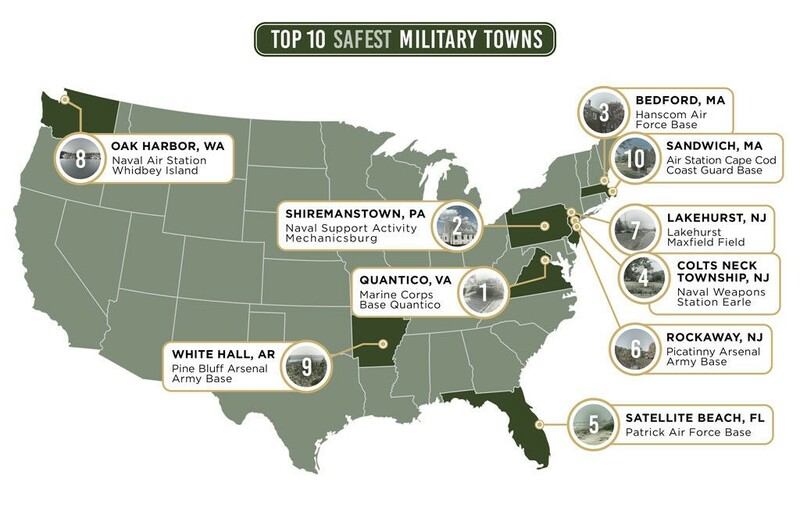 Among the ten safest military towns, three reported zero incidents of violent crime per 100,000 residents: Quantico, VA; Shiremanstown, PA; and Lakehurst, NJ. Lakehurst also has an overall national crime rate 52% lower than the national average. Two Coast Guard Yards in the two most dangerous military towns are located in Baltimore, which saw a murder rate ten times the national average in 2017. Homicides occurred at a rate of nearly one a day over the past three years, while arrests for those crimes dropped. In 2014, 41% of murders resulted in an arrest, but that figure fell to 27% by 2017. In New Jersey, home of two Navy bases and one Army base in the top ten safest military towns, violent crime fell 10% percent in 2017. The 22% decline in homicides that year was the largest percentage drop in such crimes in forty-one years. The Anniston Army Depot Base in Anniston, Alabama, isn’t just in the ten most dangerous military towns—it also has one of the highest crime rates in the country. One in twenty-nine residents of this small city is likely to be the victim of a violent crime. Using militarybases.com, we identified more than 300 active US military bases from all five branches of the armed services. We then examined the FBI’s 2017 Uniform Crime Reporting data for these areas, focusing on violent and property crime rates per capita for the city each base was located in (or the nearest city with available data). Cities without available crime data and their respective bases were excluded from the list. Due to the long-term negative impacts of violent crime, it was weighted five times heavier than property crime, which is typically prosecuted more lightly. See the full list of military duty stations and their rankings below. Reporters can email questions to media@vivintsource.com. No matter where you and your family are stationed, a security system and 24/7 monitoring can increase your personal and home safety.